On Monday, Facebook publicly announced that it had removed hundreds of accounts linked to India and Pakistan that had been disseminating politically charged messages. Facebook’s statement, written by Nathaniel Gleicher, the head of cybersecurity policy, expressed that the accounts had violated Facebook’s policies on “coordinated inauthentic behavior” and spam. Facebook removed 103 pages, groups, and accounts linked to a Pakistani network that had engaged in coordinated inauthentic behavior, involving users disseminating political or controversial messages without revealing their identities. According to Gleicher, the accounts that Facebook had removed in Pakistan were fake and used to operate “military fan pages, general Pakistani interest pages, and Kashmir community pages.” Furthermore, despite users’ efforts to conceal their true identities, Facebook was able to link many of the accounts to employees in the ISPR (Inter-Service Public Relations) department of the Pakistani military. Facebook removed 687 Facebook pages and accounts based in India for coordinated inauthentic behavior. The Indian accounts were also created with the intention of concealing their creators’ true identities. They posted frequently about local political issues. They also spread numerous messages critical of the leading Bharatiya Janata Party (BJP), which Prime Minister Narendra Modi heads. Facebook’s investigation found evidence suggesting possible links between Indian accounts and an IT cell of the Indian National Congress. Additionally, Facebook removed 15 accounts linked to Silver Touch, an Indian IT firm, for similar inauthentic behavior and 321 accounts for spam, which is a violation of Facebook’s policy that does not stipulate a concerted effort to mislead. Facebook’s decision comes at a particularly charged moment in South Asian politics, given the recent flare-up in tensions between India and Pakistan, the intensifying race to win India’s general elections, and growing recognition of social media’s role in promoting the spread of fake news both in Asia and internationally. Tensions between India and Pakistan, two historically antagonistic nations, escalated in February when both nations launched air strikes into each other’s areas of control in Kashmir, a disputed province on the border of India and Pakistan. Kashmir, which is currently divided between India and Pakistan, has been a hot topic of controversy for decades, and it still remains a symbolic representation of the animosity between the neighboring countries. 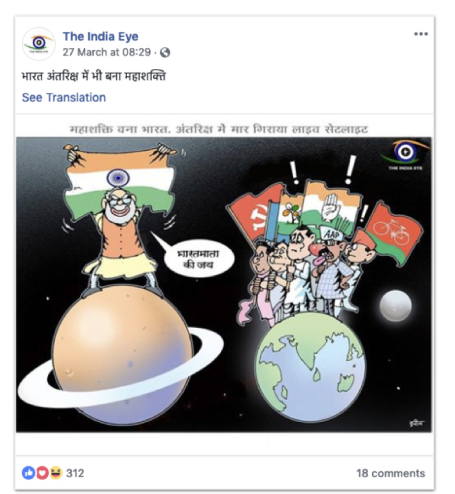 After the build-up in tensions between India’s PM Narendra Modi and Pakistan’s PM Imran Khan, various nationalist groups in both countries launched a concerted social media-based propaganda campaign. Various accounts became dedicated to spreading their political agendas, including the Pakistan Cyber Force, an ultra-nationalist account in Pakistan that spread numerous anti-Indian military messages subject to an enormous following. Many of the accounts affiliated with Pakistan Cyber Force were deleted by Facebook on Monday. Another conflict involved in Facebook’s decision is the battle between India’s two major political parties to secure victories in the nation’s upcoming general elections. PM Modi’s BJP party is going head-to-head with the INC party, and social media has been utilized as a tool by both organizations to disseminate political propaganda. Facebook’s removal of 687 accounts associated directly with the INC that had a following of approximately 206,000 accounts greatly hindered the party’s efforts to counter BJP’s own social media campaign. Facebook has been forced into ensuring accountability and preventing the spread of fake news in recent years, particularly since the issue of online misinformation gained traction after the 2016 U.S. presidential election. Now, Facebook users and critics are increasingly aware of social media’s giant role in the sphere of electoral campaigns.